Last Tuesday in cycle class, pedaling through the five-minute recovery after an hour of torture, our instructor asked if we’d like a Christmas carol or two from her playlist. The one rider with enough oxygen lashed out vehemently, “NO! It’s too early!” Well how about that; score a point for Thanksgiving. The sun set on Halloween two weeks ago and mighty Christmas is already trying to muscle its way to the forefront. But Thanksgiving has a thing or two to say first. If you please, keep the sugar plums out of my turkey and stuffing. In last week’s post, I compared popular aspects of Halloween, Thanksgiving, and Christmas (i.e. history, music, food). The final tally: Christmas the clear winner – no surprise – with Halloween solidly in second. But lest we relegate Thanksgiving to the bronze medal year after year, my blog-intent is to reinvigorate America’s late-November holiday, and remind readers why Turkey Day stands on its own merits. On that note, we’re starting November with promise. 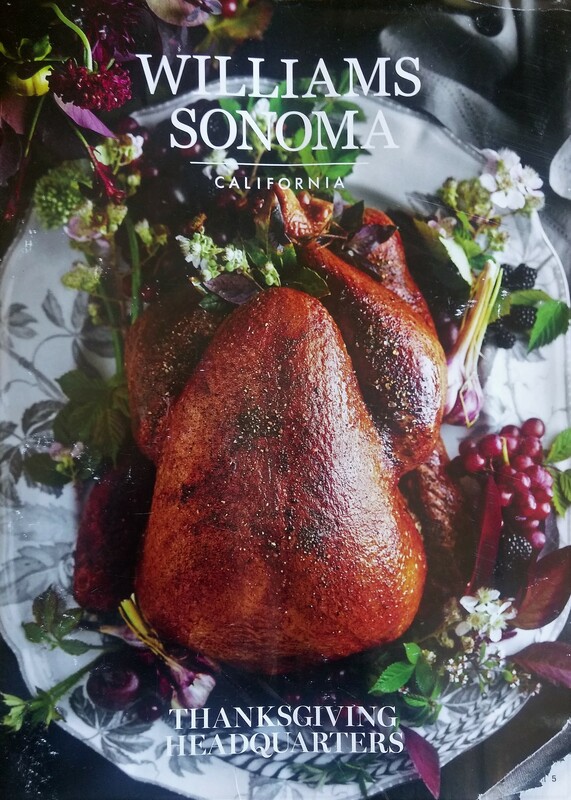 My wife is getting endless mailbox catalogs, and I was delighted to find Williams-Sonoma’s “Thanksgiving Headquarters” edition: 180 pages of food, linens, kitchenware, and decor specifically designed for the holidays. They even photo-profiled a barn-based “Friendsgiving” celebration in upstate New York. Granted, the Thanksgiving section of the catalog ended on p.67, meaning the remaining 100 pages were all about Christmas. No matter – 67 pages of Thanksgiving is impressive. Way to go, Williams-Sonoma. Starbucks also made a statement – albeit more feeble – putting their unique spin on Thanksgiving. 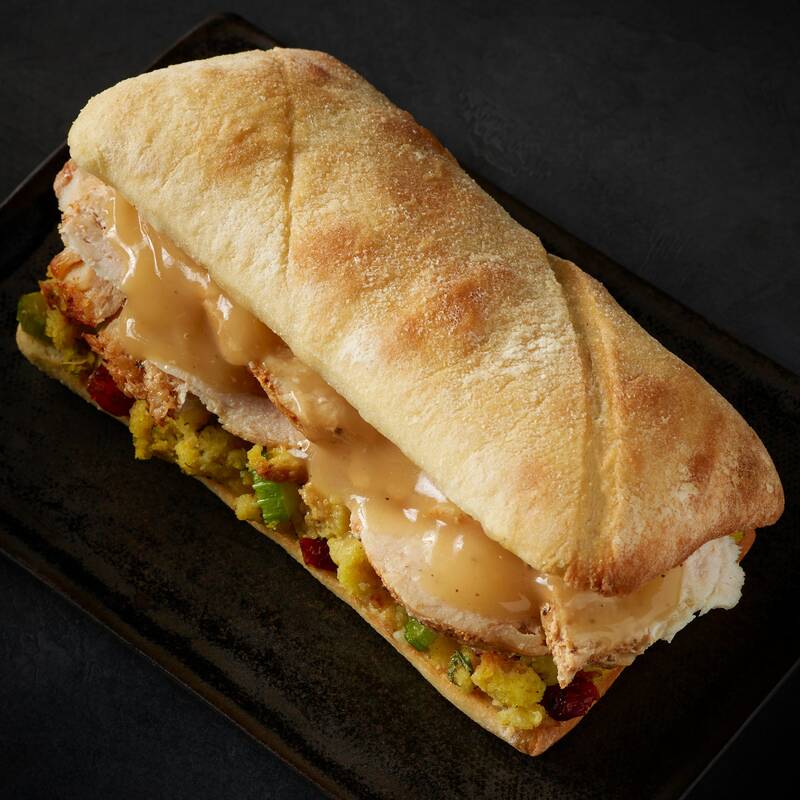 Right now, you can drive-thru and order a Turkey & Stuffing Panini (with cranberries and gravy! ), perfectly nicknamed “a handheld turkey dinner”. Then pair your panini with a Chestnut Praline Latte (“flavors of caramelized chestnuts and spices, topped with whipped cream and spiced praline crumbs”). That combo speaks more to November than December in my book. Not bad, Starbucks. Retail aside, Thanksgiving plays out as more of an extended weekend than a single day. Consider the before/after events. Wednesday (“Thanksgiving Eve”) is routinely labeled “the single busiest travel day of the year”. Well guess what? It’s not. Thanksgiving Day is the busiest travel day of the year, considering 90% of us drive our cars to the family gathering that morning. Thanksgiving Wednesday (and Thanksgiving Sunday) only seem busiest because the chaos at the airports gets so much attention. 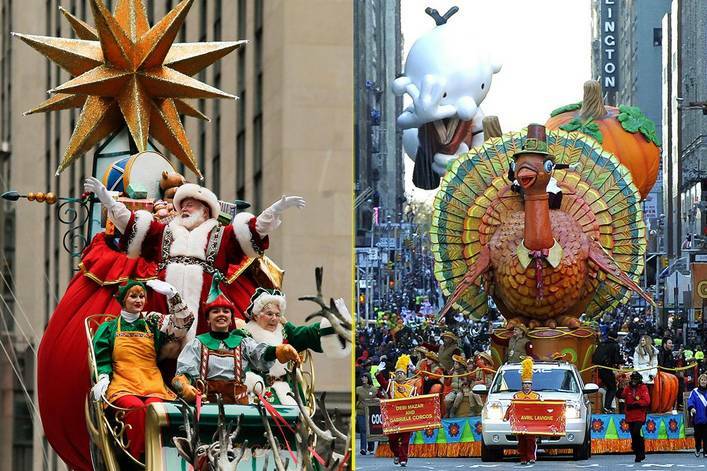 Now, on Turkey Day itself, besides the meal and the backyard football, we begin with the “Macy’s Thanksgiving Day Parade”. My family always seems to miss the broadcast because we’re so busy in the kitchen. Macy’s is three hours of marching bands, dancing Rockettes, Broadway singers, flying character balloons, and – as far as I can tell – one nod to Thanksgiving (the massive turkey in the photo above). But hang on ’til the very end of the broadcast, because… here comes Santa Claus, here comes Santa Claus, wrapping up the parade the same way he’s done every year since 1924. It’s like the Williams-Sonoma catalog – Thanksgiving on the outside but more “holiday season” in disguise. Thanksgiving Friday is “Black”, of course – the so-called beginning of the Christmas shopping season. We Americans spend over $50 billion that day (putting retailers “back in the black” with profits – hence the name). It’s safe to say this bonanza of spending isn’t going away anytime soon. By its very nature, Black Friday extinguishes Thanksgiving – almost before the pumpkin pie is served. Black Friday sales begin as early as 5pm on Thursday evening (making the name obsolete, don’t you think?) And if Thanksgiving isn’t early enough for you, some stores begin sales a week before Black Friday, with the teaser, “avoid the chaos of Black Friday – shop now!” Uh, what’s the real meaning of Christmas again? So there you have it – Christmas putting the squeeze on Thanksgiving like the Grinch on Whoville. Santa concludes the Macy’s parade at 12:00pm ET. Christmas shopping begins five hours later. In between, throw a meal on the table, mumble a blessing, and don’t forget to say thanks. If we’re not careful, Thanksgiving Day will be reduced to Thanksgiving Hour. 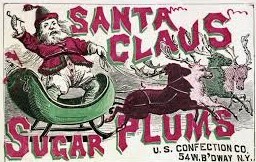 It’s a phenomenon known as “holiday compression depression” (okay, I just made that up), but hey; it’s happened before. 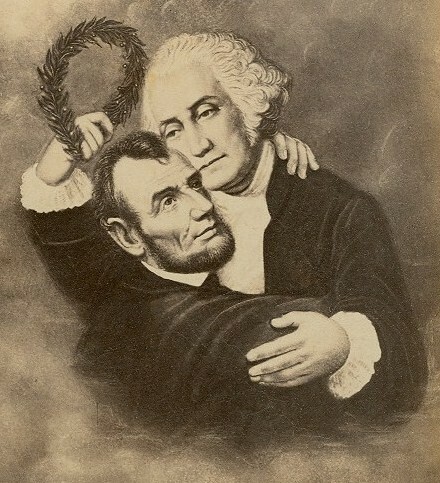 In 1971, George and Abe got their standalone birthday celebrations mashed into a single holiday. Even they feel Thanksgiving’s pain. This entry was posted in America, culture, food, holidays, memories, travel and tagged Black Friday, bonanza, Christmas, Halloween, Macy's Thanksgiving Day Parade, Starbucks, Thanksgiving, Williams Sonoma. Bookmark the permalink.